If the phrase "fairy-tale dress" was made for any label, it's Needle & Thread. The British label's handcrafted gowns are the dream for weddings, parties and pretty much any special occasion and have been worn by everyone from SJP to Jessica Alba. Because who can resist all that sparkle? With Christmas party season fast approaching, we've picked out the styles that will turn heads. And in case you're struggling to choose, be warned: The Needle & Thread team tells us the beautiful pastel-hued Dragonfly maxi is selling out fast. The Christmas collection has just landed, and the dove-grey daisy-chain dress has caused a sales stampede, though don't worry—more stock is on its way. Here are the 10 Needle & Thread dresses that will make your party wardrobe. If full-on sparkle isn't your thing, then this lace-detail tie-neck dress is a winner. Intricately embroidered flowers resemble a garden in bloom on this floor-sweeping gown. 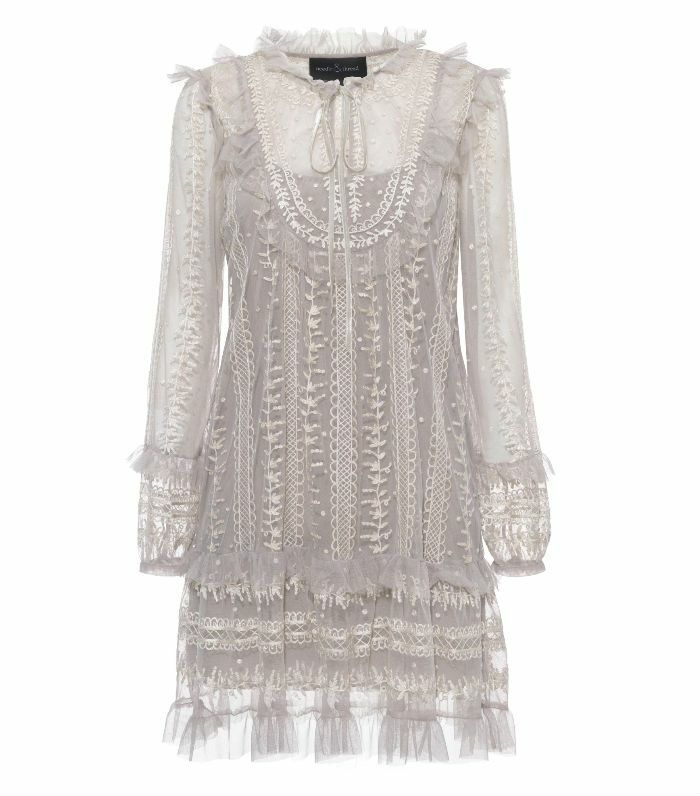 A more modest silhouette with sheer, embroidered sleeves makes this tulle gown ideal for more formal occasions. The cold-shoulder trend is still going strong, and Needle & Thread's take is oh so elegant. Tiny sequins lining the delicate lace on this tiered gown add a showstopping sparkle. It's easy to see why this tiered maxi is a best seller. This short and sweet dress is perfect for dancing. With longer sleeves, the Andromeda dress is ideal for black-tie winter events. Wear this elegant, flower-embroidered gown with silver accessories for a festive feel. This stunning ombré gown is wedding-worthy.